Contractors who contact Plumbing Webmasters want to rank higher on Google search engine results pages (SERPs). If you’re a plumber who sees a local competitor that ranks higher on Google than you when someone types in “Plumbers in (your service area),” then you want to take the appropriate steps to rank higher than them. Content quality, domain authority, and website design are key elements in your plumbing websites rankings. At Plumbing Webmasters, we use a series of tactics to increase your search engine optimization (SEO). Techniques that we use on your primary website are called On-Page SEO. Some of the strategies we use include the following. On-page SEO elements help different pages on your company website rank higher on search engines. 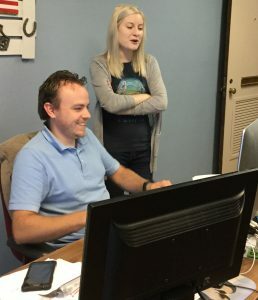 Our content writers, web designers, and coders all have years of experience and knowledge working on plumber on-page SEO. We stay on top of Google’s constant updates and changes so that you don’t have to worry about what changes they make. Each one of these elements combines to form a strategy that has your business near or at the top of Google and other SERPs. 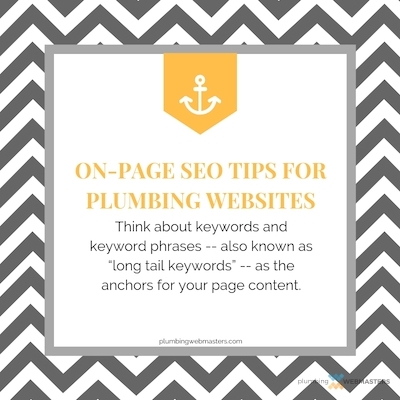 Call Plumbing Webmasters today at (877) 388-9884 to learn more about how on-page SEO can increase the leads and conversion rate today! Meta descriptions are valuable elements for plumber on-page SEO. Meta descriptions are Hypertext Markup Language (HTML) attributes that describe what your page is about. They are miniature descriptions that appear under organic search results. These meta descriptions are featured in the source code for every web page. Meta descriptions affect the following parts of on-page SEO. CTR (click-through rate): Thorough and relevant descriptions encourage more clients to click on your links. First Impression Marketing: When a potential customer is searching for service in their area, a well-crafted meta description entices them to visit your website for more information. SERP Presentation: Correct meta descriptions of proper lengths look better on SERPs than word salads that say nothing. Social Media: Meta tags appear as text when sharing your content on social media, so decent meta descriptions give your website credibility. Meta descriptions are another chance to implement your keyword strategy or embed contact information to make your page valuable to SERPs. Keywords in your meta description help boost your chances of your website making listing higher in Google SERPs and boost the potential that your page could be a featured snippet for certain industry-specific searches. Meta descriptions are part of the initial step in the market funnel. That’s the series of steps a potential client takes from searching for plumbing service to hiring your plumbing contractor business. If you’re looking for more information about how plumber on-page SEO helps increase your conversion rate, contact Plumbing Webmasters by calling (877) 388-9884 today! Meta descriptions give potential clients a brief description of the services or information they will find out about you on your website. Breadcrumbs are a valuable part of on-page SEO because they create a path on websites. They are small text paths that help users navigate your website and monitor where they’ve already been. Plumbing Webmasters add breadcrumbs to our plumbing contractor clients fully customized webpages through a WordPress CMS plugin. This allows us to add breadcrumbs to your individual service pages. These breadcrumbs combine with a comprehensive URL hierarchy to enhance the user experience and improve your websites Google and SERP ranking. Keeping your plumbing websites breadcrumbs simple keep them user-friendly since complicated breadcrumbs can confuse potential customers. Call Plumbing Webmasters at (877) 388-9884 to learn more about how breadcrumb navigation and on-page SEO boost sales and conversion rate for your plumbing business today! Updated on April 1, 2019 at 7:42 pm by Plumbing Webmasters.